Since The Hobbit: Desolation of Smaug is coming out next week, I wanted to post how I made my costume for my Legolas cosplay! This was not too difficult to make.. but very time consuming getting all the pieces together. I wore this costume to Dallas Fan Days 2013. I started making it right after I saw the first trailer for the second Hobbit movie! The first item I looked for was his tunic. I really enjoy recycling other items. So I found this vintage suede jacket on Etsy, and I just knew it would be perfect!! All it took was trimming the shape into Legolas' tunic. 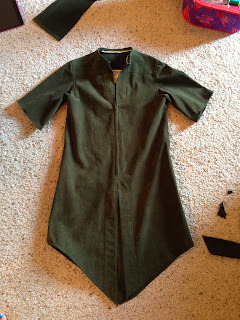 I cut off the collar, shortened the sleeves and angled the bottom. The next part was SO MUCH MORE DIFFICULT! LOL ... 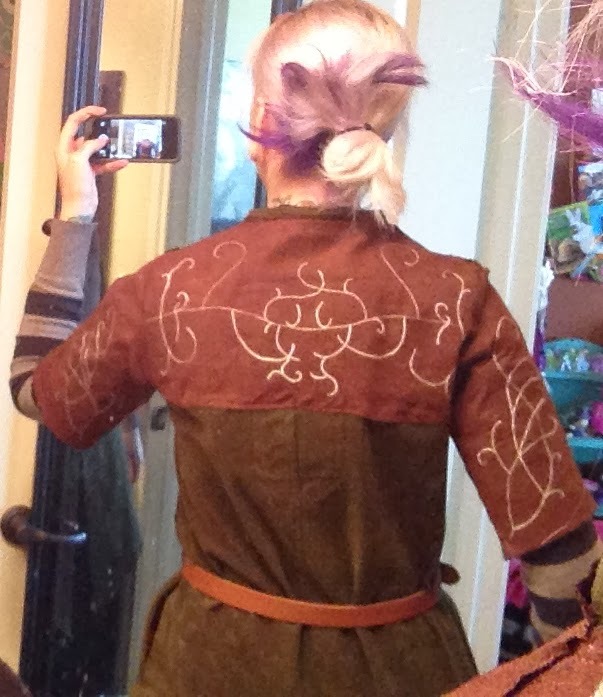 I spent ALL DAY adding the brown suede to the top of the tunic. I am sure there are patterns out there somewhere, but I decided to make my own and "just wing it." .. In the end it came out exactly how I pictured. To go along with my "wing it" philosophy.. I freehanded the swirlies with a silver sharpie. I was pretty nervous about this, but had a reference photo (seen here by Alley Cat Scratch) right next to me so I could redesign it. Next I made the quiver.. I just used a cardboard poster tube and wrapped it in some extra brown fabric I had. I used hot glue to attach it to the cardboard. The arrows were wooden dowels that I painted brown. And I added convention-friendly arrowheads. These are just pencil erasers painted silver then you glue them to the end of the wooden dowel. For the other end of the arrows, I cut feathers in half and glued them to each side of the wooden dowel. This was messy because bits of feathers got all over the place. Here is a finished look at the quiver, bow, and arrows. Also on the quiver I freehanded a swirly design with a gold sharpie (Legolas has a beautiful peacock design on his), and I attached a brown belt to the back. The bow was not made by me.. 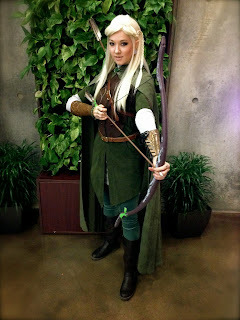 It's an officially licensed Legolas bow made out of plastic.. but I thought it looked great! I got mine on eBay for only $10 but they seem to be sold out now. 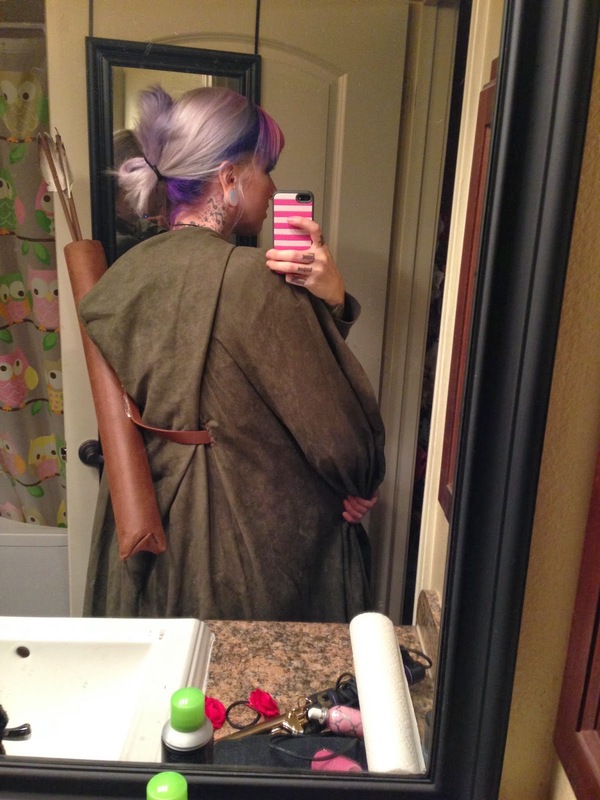 The cloak was handmade by CloaknDragon, but I had to add a hole in the back so the quiver could go through it. 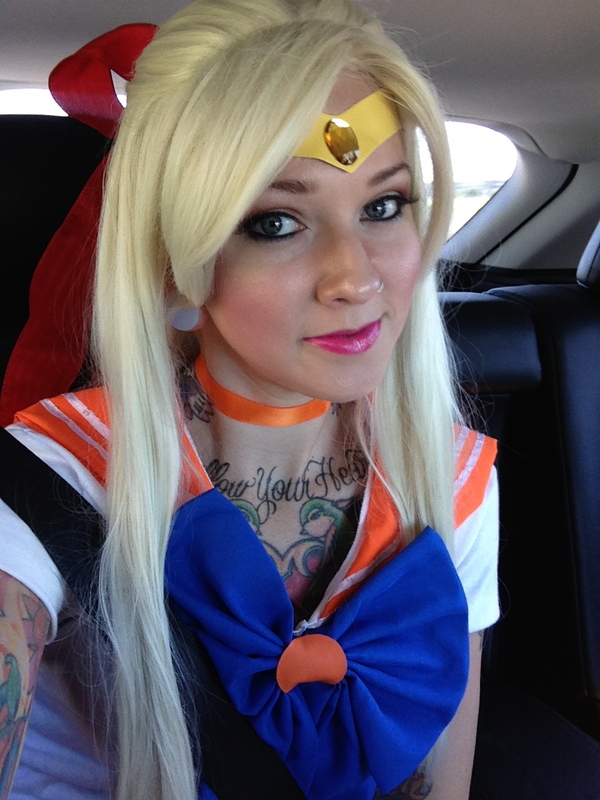 This wig is the same one I used for my Sailor Venus cosplay. 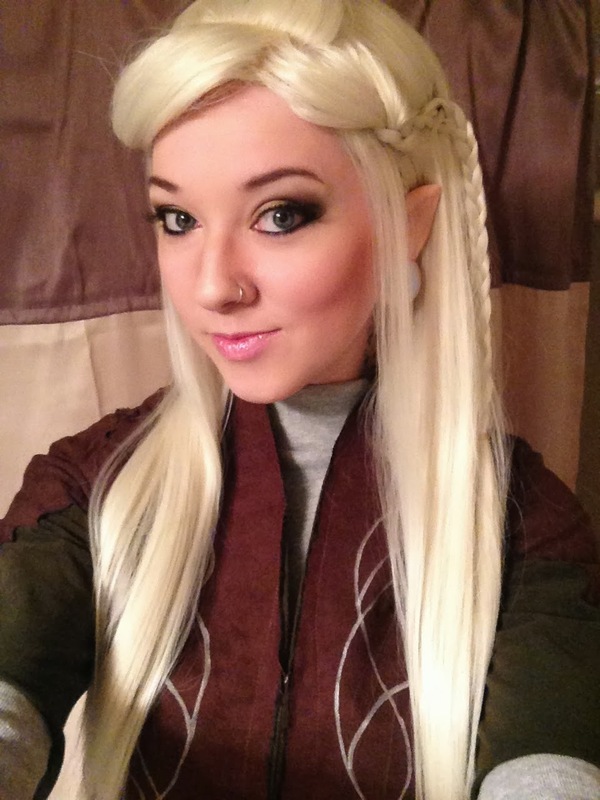 It's an Eowyn in the color Titanium Blonde by Arda Wigs. I braided it myself! 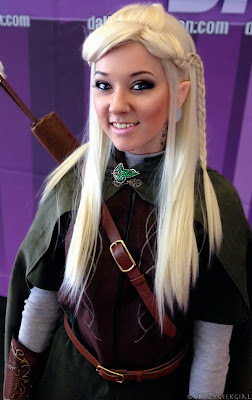 For the day of the convention, I pinned the two side braids up with bobby pins so they would look more like Legolas. This also helped my elf ears (by Aradani) show better. I did my makeup myself, too. My leggings were handmade by Wrecking Crew Creation to fit my measurements, and the grey long sleeve shirt is from American Apparel. My boots were from Walmart, and the brown belts were from Target. The brooch I wore on my cloak was from eBay and can also be worn as a necklace. 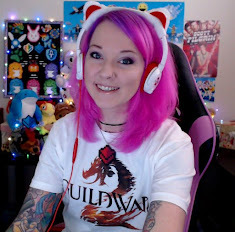 And my beautiful bracers were made by RenManLeather .. 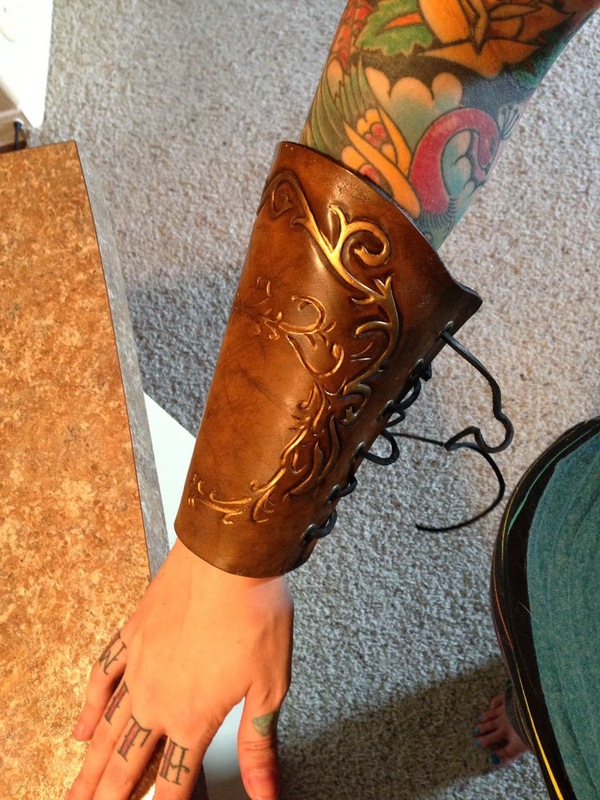 He customized these to fit my wrist and match the design to Legolas' actual bracers. These are super high quality; I cannot recommend him enough! I have never used one before and looking back in my photos I realized I wasn't holding it quite right. So if you decide to make this outfit be sure to look that up! I loved wearing this costume at Dallas Fan Days (see that full post here), and I can see myself wanting to wear it again and again. 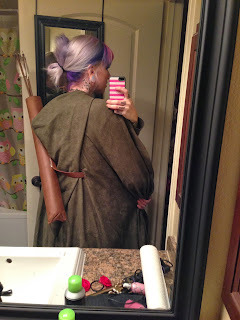 It was pretty comfy and I felt like a magical elven warrior. 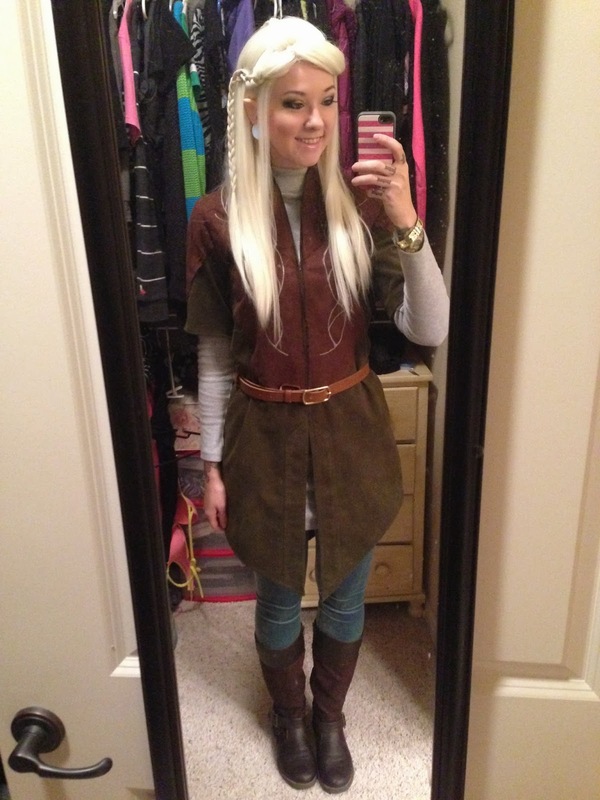 I am not sure if I'll get to wear this for The Hobbit premier, but I am definitely excited to watch the new movie and see more Legolas action! What character from The Lord of the Rings/The Hobbit is your favorite? Will you go see The Hobbit in theaters? What a great costume!! Your braids are FLAWLESS! Anna! This is incredible. You're so talented. Nice tutorial :D Painting the erasers silver is freaking genius! Great cosplay! My favorite character was always Aragorn but I also like Galadriel and I really can't wait for part two of the Hobbit because we finally get to see Smaug in full force. I second the eraser arrowheads genius. And of course your hair is totally flawless. Thank you so much for sharing. Love love love the idea for the arrowheads. My son has a Hawkeye costume and we never figured out what to do about the tips of his dowel arrows. I'm a Aragorn and Legolas fan. I'm glad you added this tutorial! I really want to go as as a lady green arrow for my next con and I'm still having trouble on how to make stuff. I agree with the comments, your erasers as arrowheads are genius and also using the poster tube as the carrier is very useful! Love this tutorial! I couldn't help but notice you didn't link the bow! I searched for it on ebay but I didn't have any luck :( Can you please link the bow? 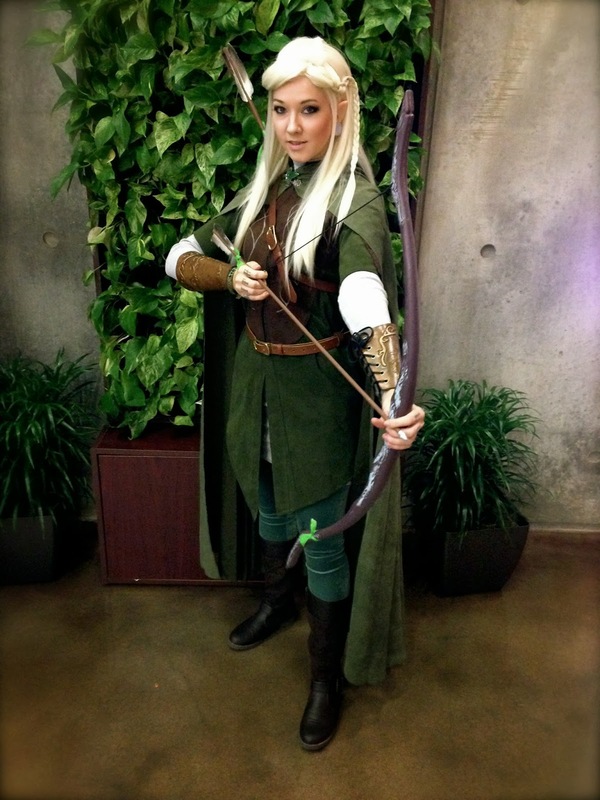 I am going as Legolas for halloween this year and I would LOVE to have that bow for my costume! Thank you for the tutorial :) It looks wonderful! Love love love. gonna try this for the renaissance festival this year! thanks for all the help! i love this! the arrow idea is absolutely genius! i was wondering how much you had paid for your bracers? also if you could put a link to the bow if you can find it. anyway this costume is flawless and i cant say enough good things about it! i just died!! this is amazing!! OMG!!! It is great!!!! I love your costume!! Hi, I'm really anxious for you to answer. I want to make this costume for Salt Lake Comic Con 2015 and I can't seem to find that suede jacket anywhere. Do you know any places/websites that sell something similar? When I was looking for a tunic for Legolas I searched and searched and searched. I tried different clothing sites, eBay, and Amazon. I eventually found mine on Etsy from a vintage seller. Try changing up the words you use when you search online like "tunic, tunic dress, brown suede, green suede, etc" or try visiting thrift shops and garage sales. Good luck! I reallly like this and i am trying to make it myself. Can you please give me a link to the suede jacket. i cant find it anywere. So im a really BIG fan of LotR. I love everything you did here. 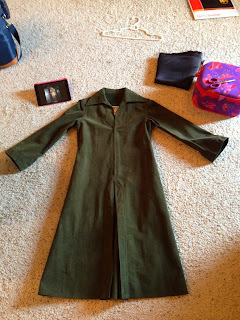 i have read the comments and everything and i know youve given suggestions, im just wondering, do u remember the name of the user you bought your green tunic from. If you dont thats ok, i was just wondering. 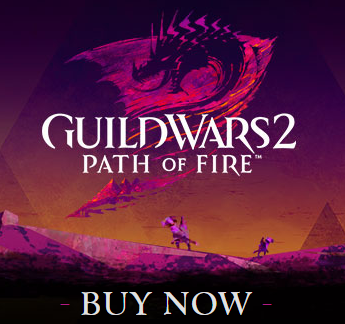 Just an FYI- yes, you were holding the arrow wrong. Real arrows have a nock in the end where you clip it on the bow string, then you lift the bow, draw the arrow back smoothly with two fingers up to your cheek, then (if shooting) release. Otherwise, just ease up until the bow is slack. DO NOT LEAVE THE BOW TAUT OR EVEN STRINGED FOR A LONG TIME. Remember to unstring the bow when you're eating or waiting in line so the bow doesn't get harmed. Also don't dryfire, or pull back the string and release without an arrow. That can break the string or weaken the bow itself. Also, I noticed you kept the tip of the arrow between your fingers. DON'T DO THAT! If you release it, the fletching (feathers) will catch on your fingers, in addition to a burn from the friction of your fingers sliding along the wood, and possibly a splinter. Maybe just take an archery class. That could help. Anyways, thanks for listening to me ramble on about safety and proper care for a bow. 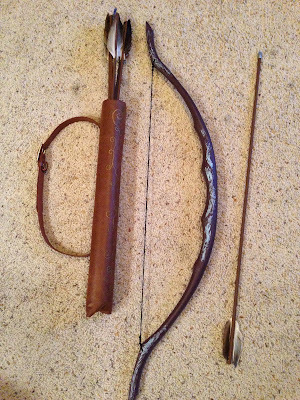 Of course, I'm talking about a classic bow, not a compound bow here, although the basics are the same. I forgot to mention the proper way for your non-dominant hand to rest. Instead of gripping the tip, let the end of the arrow rest gently on the top of your knuckle when you release. Beginners also sometimes lift their index finger over the arrow as they draw it back, but NEVER LEAVE YOUR FINGER THAT WAY.